Appliance news, reviews, ratings, forums, reports and buyers guides. Locate repairs and parts. for home and kitchen appliances. The coffeemaker can overheat, posing fire and burn hazards to consumers. Jerdon Style; at (800) 223-3571, from 8:30 a.m. to 4:30 p.m. CT Monday through Friday,or online at www.jerdonstyle.com and click on “Recall Information” at the bottom of the page for more information. This recall involves Jerdon Style model CM12B one-cup coffee makers, with date code 1217. The coffee makers are black and have an oval, red indicator light above the on/off switch. 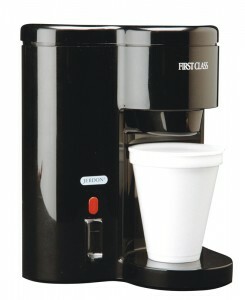 The coffee maker brews a single, eight to 12-ounce cup of coffee. The phrases “FIRST CLASS” and “JERDON” are printed in white letters on the front of the product. The model and date code are imprinted on a nameplate located on the bottom of the coffeemaker. Jerdon Style has received four reports of coffee makers overheating. No injuries have been reported. Consumers should immediately stop using and unplug the recalled coffee makers and contact Jerdon Style for instructions on how to receive a full refund. Hotel/motel product suppliers and major online retailers from July 2012 to January 2013 for between $15 and $26.